Ashbee Design: Do You Love Maps? 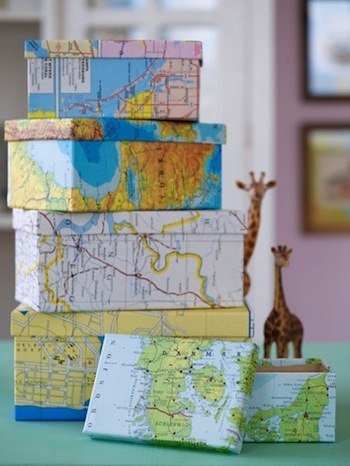 I have always loved maps. I study them, I create them, I navigate using them. I find myself wondering if this is a common trait amongst home designers. We love space and spacial relationships and tend to understand three-dimensions. Does that correlate to a more significant relationship with maps amongst designers? Interesting question. Probably a thesis in it. 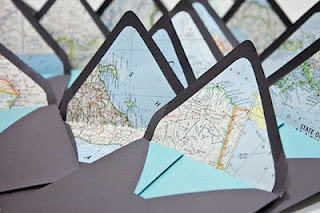 I recently completed a map project which got me to exploring other uses for maps in craft and home decor. It is a theme that resurfaces occasionally in the blogs and there are some examples of applications. Now that we are all getting in-car navigation systems or have smart phones that assist us, the need for the collection of maps has diminished. Here are some ideas for recycling them. 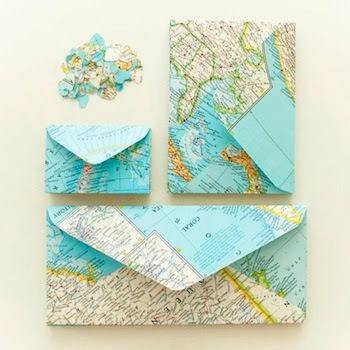 Here is a link to a site that provides instructions on how to print a Google Map of your location and use that to make an envelope. Cool. 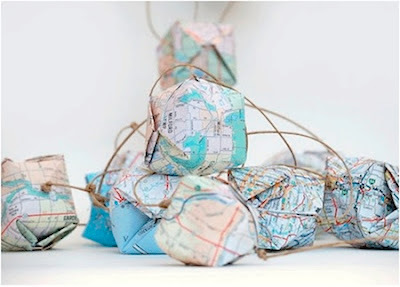 Or origami shapes shown here in a garland of globes. When using maps you need to pick carefully. Some use a better color palette than others. I have a collection of old Automobile Club (AAA) maps that are decidedly dull in color. I have been trying a variety of paper crafts with them but the results have been equally as dull. I am on the hunt for colorful maps!